If your ring is too large and spins on your finger or slips off entirely, you can use a sizing ring guard to temporarily adjust the fit. This is a particularly good idea if you have an heirloom ring or other design that can't be resized, or if you're borrowing a ring from someone else. Additionally, cold temperatures can cause many people's fingers to temporarily shrink, and a ring guard is a great way to ensure the proper fit of your precious ring during the winter months. No matter why you choose to use one, there are several great options on the market. One style features a split plastic or vinyl tube that fits over the back of the ring shank. The tube rests on the palm side of your hand, making it invisible from the front. This is a good way to temporarily change the size of a ring without spending much money, and using it doesn't require any special tools or expertise. 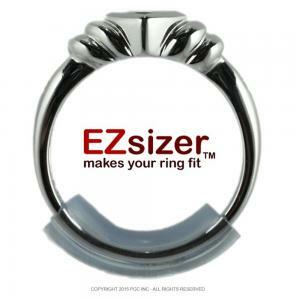 EZSizer - Sold on Etsy.com, the EZSizer is a curved tube-style guard that comfortably fits over most rings. It comes in small, medium, and large and can make your ring up to two and a half sizes smaller. It's hypoallergenic and retails for about seven dollars. Ring Noodle - Sold on Amazon, the Ring Noodle is another tube-style guard. It comes in several different widths to fit everything from very narrow ring shanks to wide bands. The food-grade vinyl is also hypoallergenic. A set of three Ring Noodles retails for about five dollars. Ring Snuggies - Claire's sells Ring Snuggies, another type of tube sizer. These clear vinyl sizers come in different sizes to fit various styles of rings. A pack of five, ranging from smaller to larger options, retails for $7.50. Locate the split in the sizing tube. This should go the length of the tube, allowing you to open it. Open the tube and slip it over the back of the ring. Try the ring on your finger. If it's too tight, take it off and use a pair of scissors to cut a small bit off the end of the tube to make it a little looser. Ring guards also come in a bar style that spans the back of your ring. Although this style is a little trickier to install, it can offer more versatile, precise sizing than a tube guard. They are also affordable and come in a range of metal colors. 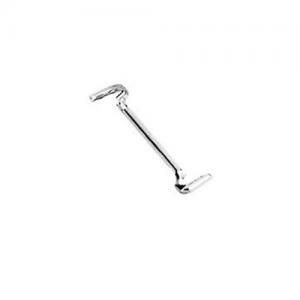 Ring Guards - These bar-style adjusters come in 14k yellow or white gold-filled metal, allowing you to match the guard to the color of your ring. 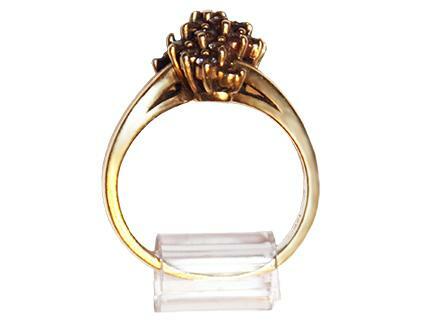 You can choose from small, medium, large, and jumbo to fit everything from slim engagement rings to chunky men's ring. They cost around $7 each. Spiral Ring Sizers - Sold by Miles Kimball, these simple adjusters come in women's and men's sizes. Although they don't fit all styles, they do work well for wedding bands and other flat or narrow rings. A set of four costs about five dollars. Gather the supplies you'll need, which are a small pair of needle-nose pliers, some masking tape, the ring guard, and your ring. Tightly wrap a layer of masking tape around each side of the pliers to keep the metal jaws from scratching your ring or the ring guard. Place the ring guard inside your ring with the wire ends resting on the band. Use the pliers to tighten on of the wire ends around the shank of your ring, making the fight as tight as possible to avoid slipping. Slip the ring on and bend the ring guard slightly so that it curves with your finger. Using your other hand, hold the guard in place as you slip the ring off. Use the pliers to tighten the other end of the ring guard in the appropriate spot. Try the ring on and adjust the guard as necessary. Another type of ring guard doesn't involve sizing at all. Wedding ring guards are designed to wrap around your engagement ring to create one cohesive look. These are a great option if you're looking for a wedding band, but they aren't what you need if you want to adjust the size of your ring. If the guard is made of metal, choose a tone that matches your ring. That way, the effect will be more subtle. Select a ring guard that's durable enough to hold up to your lifestyle. Bar-style guards may be more subtle, but they aren't quite as tough as tube guards. If in doubt, try more than one option. Ring guards are inexpensive, so you can try different styles to find the one that works best for your situation. If you're having trouble installing the guard, call the manufacturer. Many ring guard manufacturers have customer service people who can walk you through the process for their individual product. No matter which style of ring guard you choose to purchase, you'll find that this is an easy way to temporarily give your ring a perfect fit. Whether you're adjusting the size of your grandmother's heirloom diamond ring or just need to make sure your engagement ring doesn't slip off your finger in the winter, ring sizing guards are an affordable and easy fix.